In honor of the end of the year, check out my year in books with this survey courtesy of Perpetual Page Turner. You're gonna see this one a lot, and that's The Perks of Being a Wallflower by Stephen Chbosky. Few books have resonated so deeply with me, ever. Or contained such beautiful, emotional writing. A decent amount here. Asylum by Madeline Roux is the one that first comes to mind. The writing was sub par, the plot bland, the characters stilted. It wasn't bad, but considering my high hopes, it wasn't what I expected. Ink by Amanda Sun was another disappointment. I started it expecting cool Asian fantasy and got Japanese Twilight. Still haven't finished it. Oh, and then Drain You by M. Beth Bloom. I didn't think it possible for me to feel so mediocre about a book named after Nirvana and set in the 90s. And Between the Devil and the Deep Blue Sea by April Genevieve Tucholke. I guess I'm picky. I think Pantomime by Laura Lam. I was expecting a circus fantasy romp and I got that, but I also got a fantastic commentary on gender identity and the nature of love. It was much deeper than anticipated, and I'm psyched for the sequel. Probably The Perks of Being a Wallflower by Stephen Chbosky. I'd just read it for the first time this year and fell immediately in love. Then proceeded to bug all of my friends about it. Not sure if I've been successful yet. I also touted Warm Bodies by Isaac Marion a decent amount, but was much more successful in pitching the movie. Gah, do I have to pick? It's a tie between Splintered by A.G. Howard (who is not A.E. 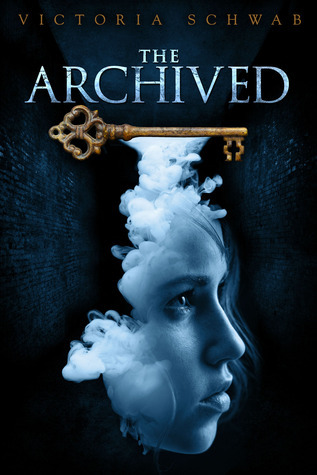 Howard) and The Archived by Victoria Schwab. Both of which are fantastically original books written by sweet, friendly authors. 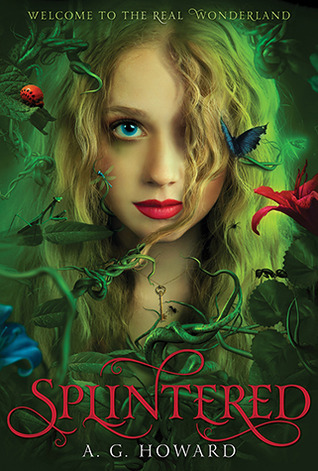 Splintered is the Alice in Wonderland revamp of my dreams, while The Archived takes ghosts to a whole new level. 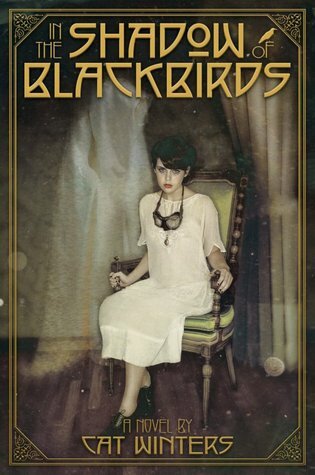 Favourite new author you discovered in 2013? I can't pick just one. But I would like to highlight Bridget Zinn, whose whimsical novel Poison was published after her untimely death from cancer. She's a sweet voice, lost too soon. Others I discovered and loved this year are R.J. Anderson, J.R. Johansson, Cat Winters, Julie Berry, and A.S. King. Definitely Dare You To by Katie McGarry. I don't really read romance. Not for adults, not for teens. I'm a sucker for a good romantic subplot, but your basic Harlequin guy-and-girl-smooching-on-cover is not my thing. However, this was so well-liked that I gave it a try. I didn't love it, but I liked it a lot more than I thought I would. It was a fun read with more depth than I was expecting. I don't know if it sold me on romance, but it definitely exceeded my expectations. Most thrilling, unputdownable book of 2013? That'd be Reality Boy by A.S. King and The Archived by Victoria Schwab. I mean, I actually shunned human contact to read these books. And was late to meet friends. And had to cover the bottom of the page with my hand to avoid reading ahead. All the Truth That's in Me by Julie Berry gets an honorable mention because I actually had to not put it down so I could read it in time for my mail date, but it also made it very easy to read for five hours straight til six in the morning. Book you read in 2013 that you're most likely to reread next year? This is a toughie because I don't really have time to reread books. The one I'd most want to reread is The Perks of Being a Wallflower by Stephen Chbosky, which became one of my instant favorites. However, I'm most likely to reread Howl's Moving Castle by Diana Wynne Jones, because it's short and I usually end up reading it at least once a year. I think Ananna from The Pirate's Wish by Cassandra Rose Clarke wins this one. She's feisty, beautifully drawn, and saves herself again and again. I think The Mad Scientist's Daughter by Cassandra Rose Clarke takes the crown for this one. I was absolutely mesmerized by it. I don't think I've ever highlighted so many pieces in a single book. There's something lyrical about it, something almost magical. Miss Peregrine's Home for Peculiar Children by Ransom Riggs is a close second. You don't get as much ornate, literary writing in young adult, but Riggs works it in without being pretentious or overbearing. Definitely The Perks of Being a Wallflower by Stephen Chbosky. I was going through a really rough time when I read that book, and it touched a lot of places in the back of my mind. Crown of Midnight by Sarah J. Maas inspired me in a different way. It reminded me why I love writing, and fantasy. Book you can't believe you waited until 2013 to read? This goes to The Perks of Being a Wallflower again. It's been around for ages and it's exactly the kind of book I love, but I'd never gotten around to it. I guess the shortest would be Steam by Jessica Fortunato and the longest is maybe The Informers by Bret Easton Ellis. I could be making that up. Book that had a scene in it that had you reeling and crying and dying to talk to somebody about it? Ugh, Crown of Midnight by Sarah J. Maas. I got to some of the bits and had to immediately email Christina of Christina Reads YA because I was so distraught. Favourite relationship from a book you read in 2013? Ananna and Naji from The Pirate's Wish by Cassandra Rose Clarke. They're so sweet, organic, natural. There's no insta-love. No easy breaks. Just two people slowly finding each other. That'd be Looking for Alaska by John Green. He's quickly become one of my favorite authors and will be staying in that list a long time. Best book you read in 2013 that you read based solely on a recommendation from someone else? I don't think I actually have one for this list. Kind of sad, isn't it? Genre you read the most in 2013? Maybe Morpheus from Splintered by A.G. Howard. He's got that dark, brooding, snarky thing going on that I just can't resist. If You Find Me by Emily Murdoch was pretty breathtaking for a debut. Strong characters, exciting plot, a story that stuck with me. The worlds in Splintered by A.G. Howard and The Pirate's Wish by Cassandra Rose Clarke were both beautifully written and I could feel myself there. They were worlds that I wanted to live in. Poison by Bridget Zinn. It's a ridiculous, whimsical story that's just pure fun. Not gritty like a lot of stuff coming out these days. Just entertaining and clever and lovely. Book that made you cry, or nearly cry, in 2013? The Mad Scientist's Daughter by Cassandra Rose Clarke. I mean, good god! Heartstrings, much? Then Crown of Midnight by Sarah J. Maas got to me in a different way. Seriously, why don't I see The Pirates Wish by Cassandra Rose Clarke or A Spark Unseen by Sharon Cameron on every shelf?! They're loads better than some of the stuff out there or just as good, and they're SO well written and fun and delightful! One book that you didn't get to in 2013 but will be your No.1 priority in 2014? 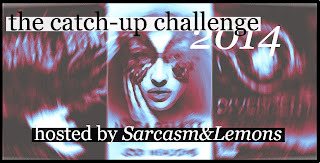 Ha, you can find a list on my Challenges page. But maybe the biggest one would be Divergent by Veronica Roth. I mean, seriously, how am I the only one who hasn't read it yet? That'd be Evertrue by Brodi Ashton. I adored the first two books (which are so, desperately underrated) and the conclusion sounds like it'll rock. Also, Jack and Cole. This one of tough. Maybe Of Unbreakable Things by A. Lynden Rollen. It sounds like the perfect mix of creepy eerie psychological fantasy. My big goal is to catch up on all of the long series I've never read (and seem to be the only one). I'd also like to read more for myself and less for what I think people will want, and of course, to keep up better with my ARCs.